PosterPro Satin is a photo realistic photo paper that features a smooth finish and is designed to be printed with latex inkjet printers. The smooth finish on this product provides a perfect surface for latex inks. Preserves a low glare gloss level for impressive pictures and graphics. Ideal for tradeshow graphics, posters, POP displays and images. 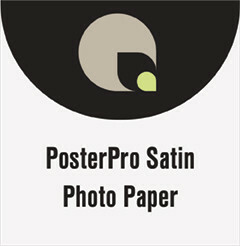 PosterPro Satin can be laminated. Posted in the categories Filter by Printer, Filter by Print Media, Filter by Brand.